Il est vain de se chamailler sur le fait que Frank Sinatra est ou n’est pas un chanteur de jazz. On doit simplement convenir que tout au long de sa carrière, il a entretenu les meilleures relations musicales possibles avec de grands jazzmen, de ses débuts chez Harry James puis Tommy Dorsey jusqu’aux multiples enregistrements et concerts qu’il mena avec le concours éminemment swingant des orchestres de Count Basie ou de Duke Ellington. Récompensé comme vocaliste, il recevait au piano le soutien d’un de ses pairs, Nat King Cole en personne… Frankie citait Louis Armstrong et Billie Holiday parmi ses influences les plus fortes, ainsi qu’une dame qu’on a bien oubliée et à laquelle Django Reinhardt rendit deux fois hommage dans ses compositions, Mabel Mercer. 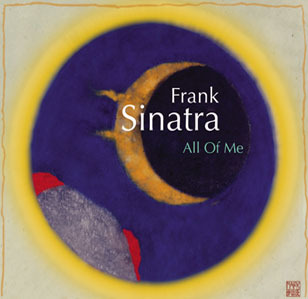 C’est à partir du style de ces artistes afro-américains que Sinatra forgea le sien, et inventa, dans le domaine de la chanson populaire, une approche nouvelle dans l’interprétation des ballades. À cet égard, les versions qu’il offre, entre 1946 et 1950, des grandes chansons que sont One For My Baby, September Song, April In Paris, If I Had You, Body And Soul ou I Should Care, constituent des modèles qui seront pillés sans être égalés. Tandis que les tempos plus enlevés de Saturday Night, Blue Skies, When You’re Smiling ou Begin The Beguine en firent gambiller plus d’un et plus d’une. Le plus étonnant étant que ces enregistrements plus que cinquantenaires ont gardé leur fraîcheur et leur charme et ne s’adressent donc pas seulement à la nostalgie. 1.Saturday Night02:42 (Styne Jules - Cahn Sammy - Styne Jules - Cahn Sammy) with George Siravo and His Orchestra featuring Arthur Baker (cl)..
2.All Of Me02:49 (Marks Gerald - Simons Seymour - Marks Gerald - Simons Seymour) with Axel Stordahl and His Orchestra. 3.Blue Skies02:32 (Berlin Irving - Berlin Irving) with George Siravo and His Orchestra. 4.One For My Baby03:02 (Mercer John - Arlen Harold) with Axel Stordahl and His Orchestra. 5.Nevertheless03:07 (Ruby Harry - Kalmar Bert - Ruby Harry - Kalmar Bert) with Axel Stordahl and His Orchestra featuring Billy Butterfield (tp)..
6.Mean To Me03:16 (Ahlert Fred E. - Turk Roy - Ahlert Fred E. - Turk Roy) with Axel Stordahl and His Orchestra featuring Gordon Griffin (tp)..
7.April In Paris02:42 (Duke Vernon - Harburg E.Y. - Duke Vernon - Harburg E.Y.) with Axel Stordahl and His Orchestra featuring Billy Butterfield (tp)..
8.That Old Black Magic02:36 (Mercer John - Arlen Harold) with Axel Stordahl and His Orchestra. 9.Night And Day03:42 (Porter Cole - Porter Cole) with Axel Stordahl and His Orchestra. 10.September Song03:10 (Anderson Maxwell - Weill Curt) with Axel Stordahl and His Orchestra. 11.If I Had You03:10 (Shapiro Ted - Campbell James - Connelly Reginald - Shapiro Ted - Campbell James - Connelly Reginald) with Axel Stordahl and His Orchestra. 12.Sweet Lorraine03:11 (Burnwell Clifford - Parish Mitchell - Burnwell Clifford - Parish Mitchell) with The Metronome All Stars : Charlie Shavers (tp), Lawrence Brown (tb), Johnny Hodges (as), Coleman Hawkins (ts), Harry Carney (bar), Nat King Cole (p), Bob Ahern (g), Eddie Safranski (b), Buddy Rich (d)..
13.My Blue Heaven02:25 (Donaldson Walter - Whiting George - Donaldson Walter - Whiting George) with George Siravo and His Orchestra. 14.Body And Soul03:20 (Eyton Frank - Green John - Sour Robert - Heyman Edward) with Axel Stordahl and His Orchestra featuring Bobby Hackett (tp)..
15.The Continental02:31 (Magidson Herbert - Conrad Con) with George Siravo and His Orchestra. 16.I Should Care02:59 (Weston Paul - Cahn Sammy - Stordahl Axel - Weston Paul - Cahn Sammy - Stordahl Axel) with George Siravo and His Orchestra. 17.Bye Bye Baby02:40 (Styne Jules - Robin Leo - Styne Jules - Robin Leo) with Hugo Winterhalter and His Orchestra and The Pastels (voc)..
18.The Brooklyn Bridge02:39 (Styne Jules - Cahn Sammy - Styne Jules - Cahn Sammy) with Axel Stordahl and His Orchestra. 19.When You're Smiling02:26 (Fisher Mark - Shay Larry - Goodwing Joe - Fisher Mark - Shay Larry - Goodwing Joe) with George Siravo and His Orchestra. 20.Deep Night03:15 (Handerson Charles - Vallee Rudy - Handerson Charles Vallee Rudy) with Harry James and His Orchestra. 21.The Song Is You03:16 (Kern Jerome - Hammerstein II Oscar - Kern Jerome - Hammerstein II Oscar) with Axel Stordahl and His Orchestra. 22.Lover02:41 (Rodgers Richard - Hart Lorenz - Rodgers Richard - Hart Lorenz) with George Siravo and His Orchestra. 23.Begin The Beguine03:00 (Porter Cole - Porter Cole) with Axel Stordahl and His Orchestra. 24.There's No Business Like Show03:22 (Berlin Irving - Berlin Irving) with Axel Stordahl and His Orchestra with male chorus.